The story of OCEAN REEF begins in 1950 with a simple passion for diving and innovative ideas. Through the spirit of intrepid pioneers, brilliant inventors, passionate divers, and dynamic entrepreneurs, OCEAN REEF has been able to turn dreams into reality in the underwater world. Scuba Center is an authorized Ocean REEF Dealer. A full-face snorkeling mask with a wide field of view for shallow freedives and surface snorkeling. ARIA allows divers to breathe through their nose, while the "dry top" prevents water from getting into the snorkel. 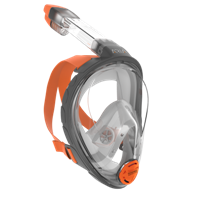 The ARIA sports the largest field of vision of any snorkel mask around. Inside the mask frame breathing circulation guarantees no fogging and no extra stress.